Kala Patthar (5555 m), meaning 'black rock' in Nepali, is a mountain in the Nepalese Himalayas near Mount Everest Base Camp just above Gorekhshep. It appears as a big brown bump below the impressive south face of Pumori (7,161 m/23,494 ft). Many trekkers in the region of Mount Everest attempt to summit Kala Patthar, since it provides the most accessible point to view Mt. Everest from base camp to peak (due to the structure of Everest, the peak cannot be seen from the base camp). The views from almost anywhere on Kala Patthar of Everest, Lhotse and Nuptse are spectacular. During our Mount Everest special Helicopter tour, we make a stop at Kalapattar and give time to enjoy the Himalayan scenery and capture the images of Mount Everest and other world highest peaks in their mind and camera. Your eyes and the cameras will be stunned to capturing such marvellous views of giant summit inlcluding the top of the world, Mt. Everest. The take off begins from Kathmandu airport. The six seater helicopter with an experienced pilot will accompany us during this flight to Everest. We spend about 4 hours in exploring entire Everest region. We land at Kalapatthar and spend 30 minutes there. ➺Pick up from the hotel in Kathmandu and transfer to the airport. ➺Land the Helicopter in Kalapattar. Free time to enjoy the Himalayan scenery with the views of Mount Everest and several other mountains. ➺Fly back to Kathmandu by helicopter. Airport drop and pickup by private vehicle. 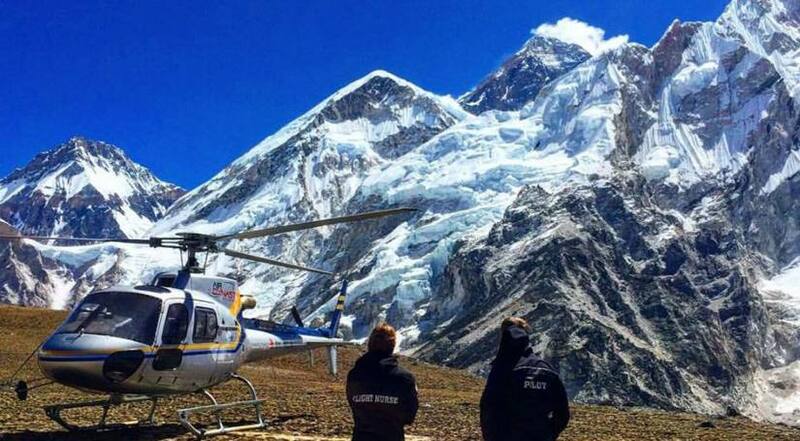 Helicopter tour to Everest Base Camp and Kalapattar and return. One hour stop at Kalapattar for sightseeing. Commercial filming charges (Normal video Camera are permitted without additional cost).